Woodland is a wide-open park of gently rolling hills (lots of them), mowed grass, and runnable forests, interlaced with paved and gravel trails. 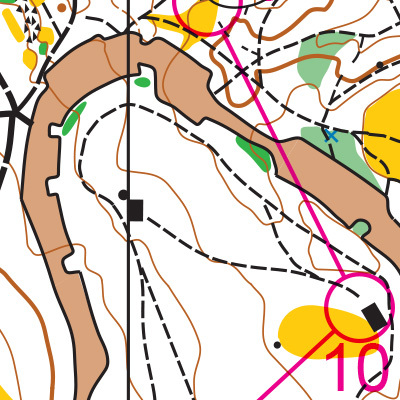 It is a popular cross-country venue for its varied terrain and fall colors, and popular orienteering venue for the same reasons. 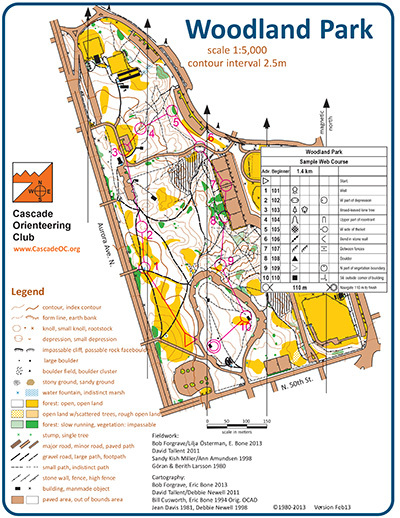 It is the location for the club’s National Orienteering Week event each year, and a great place to start practice contour recognition and compass skills. With so much open ground, Woodland Park is relatively easy to navigate. However, with numerous similar features, such as bridges and shelters, it’s also easy to make a parallel features error. And the wooded area near the tennis courts can feel rather homogeneous. Most of the park is completely runnable, without complete disregard for footing. And yet, because it is so fast for running, gently rolling hills start to add up. At a certain point, physical conditioning matters. Before Aurora, turn right into the gravel parking lot past the paved loop on your right.